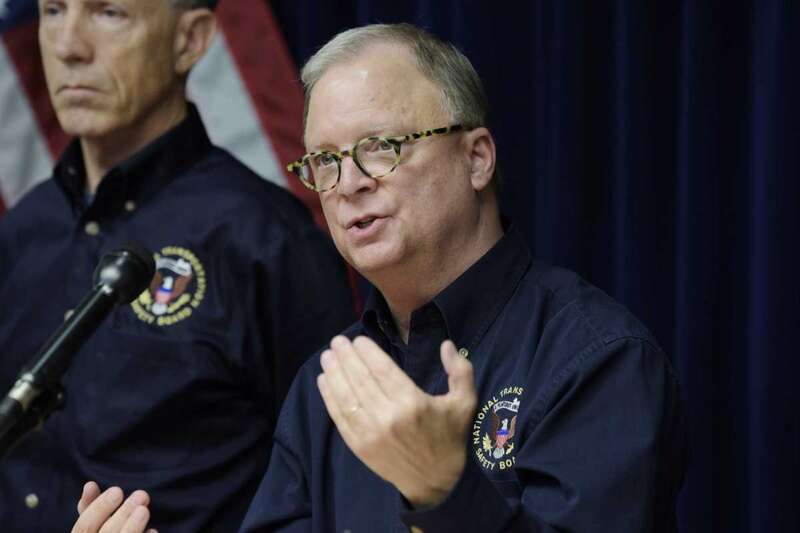 National Transportation Safety Board Chairman Robert Sumwalt talks about the investigation during a press conference on the Schoharie vehicle crash at State Police Troop G Headquarters on October 8th, 2018, in Latham, New York. National Transportation Safety Board investigator Pete Kotowski, investigator in charge for the Schoharie crash, answers a questions during a press conference at State Police Troop G Headquarters on October 8th, 2018, in Latham, New York. 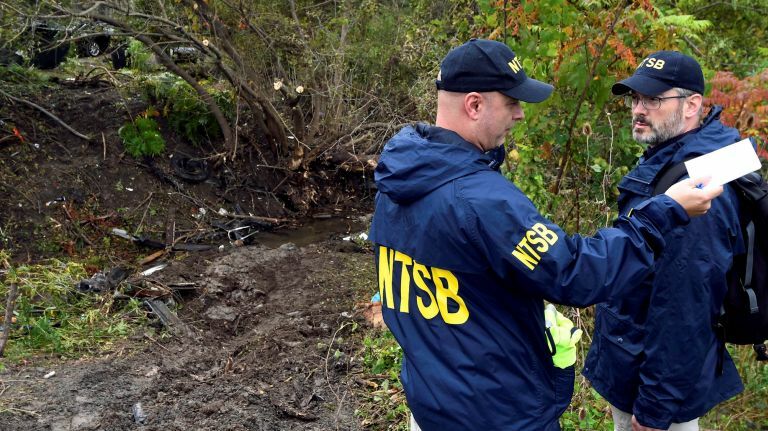 ALBANY, New York — A judge has scheduled a conference between a local prosecutor and National Transportation Safety Board inspectors to try to forge an agreement over access to a limousine that crashed three months ago, killing 20 people. Schoharie County Judge George Bartlett sent a letter Friday afternoon to District Attorney Susan Mallery and Kathleen Silbaugh, counsel to the National Transportation Safety Board, saying, "This standoff must come to an end." Bartlett rejected Mallery's assertion that her criminal investigation trumps the NTSB's work. The National Transportation Safety Board says Mallery has blocked National Transportation Safety Board investigators from getting within 15 feet (4.5 meters) of the limo that crashed October 6th, 2018 in rural Schoharie. Bartlett scheduled a conference between prosecutors, defense lawyers and National Transportation Safety Board on January 29th. The limousine's operator has pleaded not guilty to criminally negligent homicide. The National Transportation and Safety Board members as well as Forensics Investigators from the New York State Police worked at the site of the limousine accident near the Apple Barrell tourist spot October 8th, 2018 in Schoharie, New York that took the lives of twenty people. 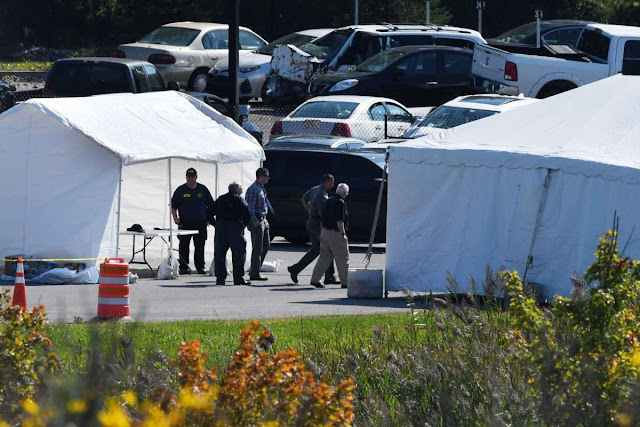 National Transportation Safety Board investigators and state police are examined the limousine that took the lives of 20 in Schoharie County, as they search for answers under the cover of a tent at State Police Troop G Headquarters on October 9th, 2018, in Latham, New York. 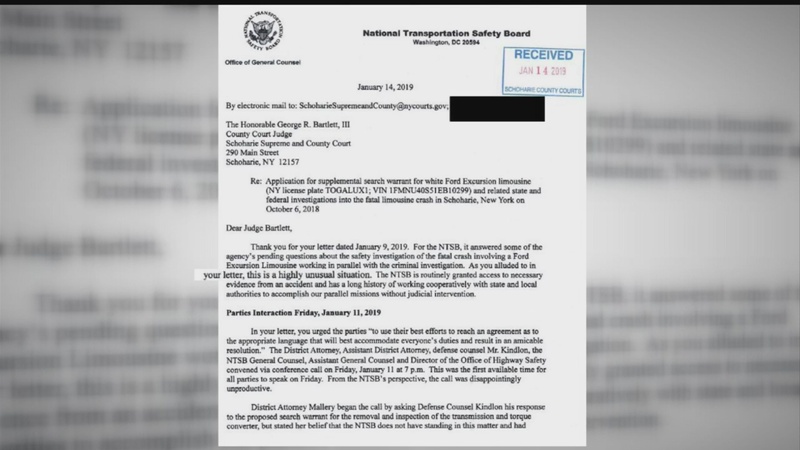 SCHOHARIE, New York — District Attorney Susan Mallery is accusing the National Transportation Safety Board of using the press to try to "coerce law enforcement" into allowing NTSB investigators unlimited access to the limousine that crashed and took 20 lives in Schoharie on October 6th, 2018. The Schoharie County prosecutor expressed her ire in a testy letter Wednesday to County Court Judge George Bartlett III. Mallery wrote it was to correct "legal and factual inaccuracies." She chided the NTSB and did not spare the judge. "The families of the 20 deceased young people deserve a fair trial. If the NTSB's intervention, and the court's continuing cooperation with it, result in evidence being tampered with or destroyed by a non ­party to the criminal proceeding, the People's ability to go forward will be impaired," Mallery wrote the judge. Mallery, a first-term district attorney in rural Schoharie County, is prosecuting the case of Nauman Hussain of Cohoes, the operator of Prestige Limousine, who is charged with criminally negligent homicide in connection with the crash. Mallery and the NTSB have been at odds over the federal agency's access to the 2001 Ford Excursion limousine involved in the crash. The NTSB's goal is to determine the cause of the crash and issue safety recommendations. In her letter, Mallery called the NTSB a "non party" to the criminal case, which was investigated by State Police. "While law enforcement and the defense proceeded to conduct and complete necessary inspections of the limousine, the NTSB unfortunately engaged in an extensive press campaign, seeking to coerce law enforcement to provide virtually unlimited access to the limousine," Mallery stated. "We simply cannot allow evidence to be tainted, altered or destroyed. We will insist that the ultimate trial in this case not be jeopardized," Mallery stated. "It is concerning that politics are seemingly of much greater concern to some than justice for the victims and grieving families of the tragic limousine crash in Schoharie, New York on October 6, 2018. I would be remiss if l did not aggressively ensure the integrity of the criminal prosecution of this major case." The district attorney's letter came in response to the judge's earlier request that Mallery, NTSB and Hussain's defense attorney, Lee Kindlon, file motions by Wednesday. On January 9th, the judge proposed NTSB be added to the original search warrant that allowed State Police access to the vehicle. Mallery said Bartlett made the determination without input from the parties in the case. Mallery, who said she does not oppose NTSB inspecting the vehicle under proper safeguards, wrote she asked NTSB director Robert Molloy on Dec. 28 to issue a joint news release to dispute press reports. "I urged the NTSB to comply with professional standards and to work together to restore public trust in the investigation. 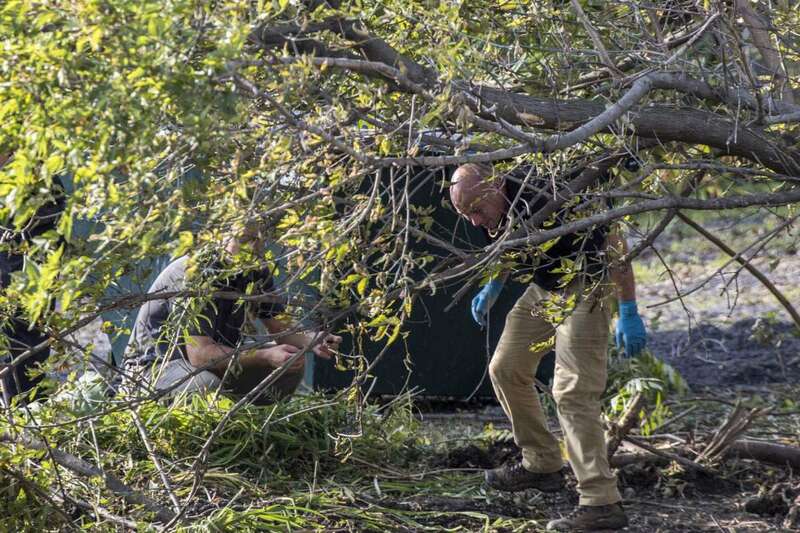 The NTSB declined to do so and did not formally reply to that correspondence," Mallery wrote. Mallery said the law does not allow a judge to give the NTSB unfettered access to the vehicle. "In order to break the NTSB-created impasse, the People nonetheless propose the following lawful, common-sense solution," Mallery wrote. She proposed allowing the NTSB — under supervision of State Police — to inspect, photograph and measure the limo. "No alteration, removal or destruction of the evidence by representatives of the NTSB will be allowed," she wrote. 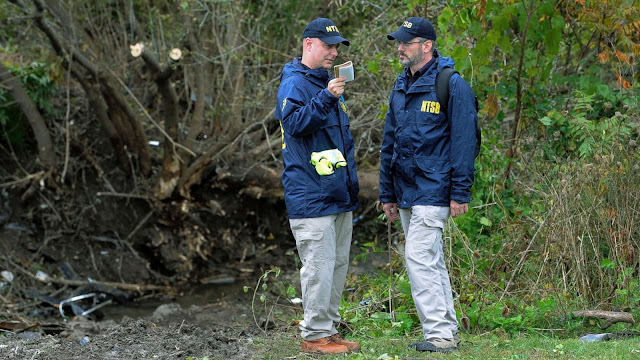 NTSB officials could not be immediately reached. The deadlock between Mallery and NTSB has been so heated that, according to court filings, Mallery hung up on Kathleen Silbaugh, the NTSB's general counsel, during a conference call on January 11th. Gut feeling tells me the NTSB isn't the problem here. Well, the District Attorney is the in-charge authority of this crash. They are looking to see if something happened that is *criminal*. Chain of evidence starts at that *crime scene*. IMO, NTSB should let the State Police and District Attorney do their work. 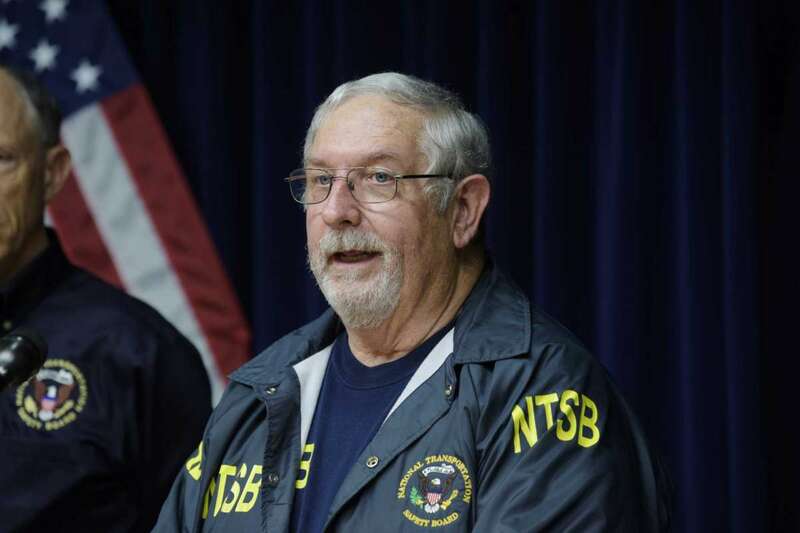 The NTSB has forgot more about accident investigation than the state police will ever know. Who is the district attorney protecting here? Perhaps somebody needs to look under the table, she may be getting a payoff. As far as preserving evidence, has she ever heard of a camera? ^^^ This. Limo operators are a lot like South Florida 134.5 and 135 operators. This is why the NTSB needs to look at the remains of the crash. Is it possible it was a structural failure leading up to loss of control from a poor stretch job? We may never know as enough people have had access to the remains of the vehicle. The NTSB in air crash debris would call this tainted evidence. Anything is possible and the DA's aggression towards the NTSB wanting to do their job raises flags. Oh and one more thing: this crash falls under the federal jurisdiction of the NTSB as a for hire business on the highways, and the last time I checked, federal government authorities and courts > state authorities and courts. The stench from the bench is making me clench. No one will ever be prosecuted for this horrific accident. State police have authority over the approval of modifications of street vehicles within their jurisdiction, whether for hire or not- including yearly inspections of factory cars and trucks. Sensing there may be something going on here that may put the SP in a bad light- perhaps a "pencil whipped" inspection of the mod by an officer- who knows.